Thanksgiving in Turkey. Deal Alert! 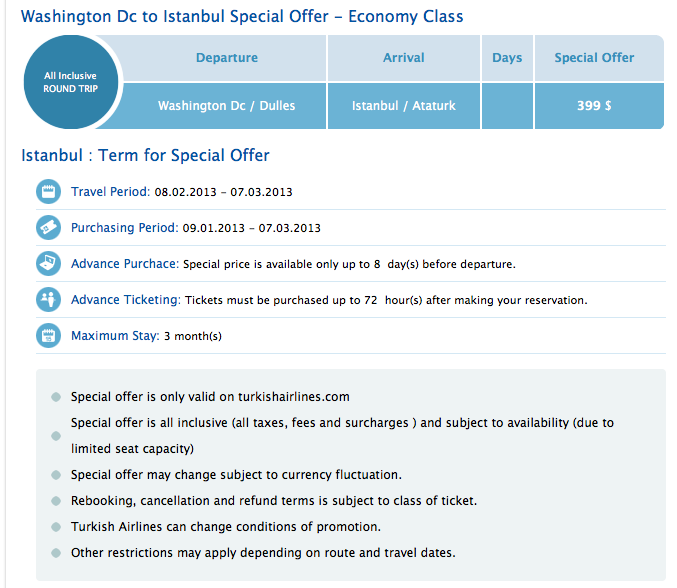 Chicago >< Istanbul $532 r/t. *March 14, 2013 UPDATE* Even though the deal is over, this post still contains useful information on KLM “Economy Comfort” seating and prices. 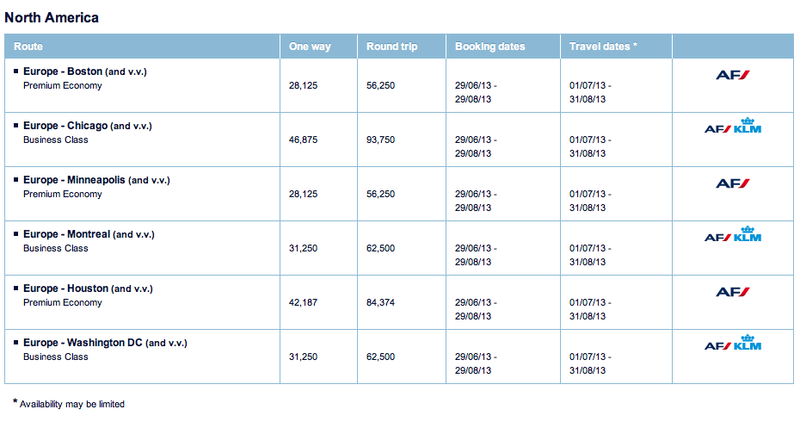 *FEBRUARY 12, 2013 UPDATE* Istanbul is still an under $500 bargain. Delta from Newark fare must be purchased by February 17 and started by February 24. Other origins possible under $760. *NOVEMBER 15, 2012 UPDATE* The KLM/AIR FRANCE/DELTA offer from CHICAGO (ORD), Originally scheduled to end November 6, is still available for $532. $532 roundtrip from Chicago (ORD) to Istanbul (IST) is a fabulous bargain you can also use for travel in January, February, and March. It’s a one-stop (to Amsterdam) flight on KLM. (A similar deal is offered on United connecting to its non-stop from Newark.) Book by November 8, 2012. 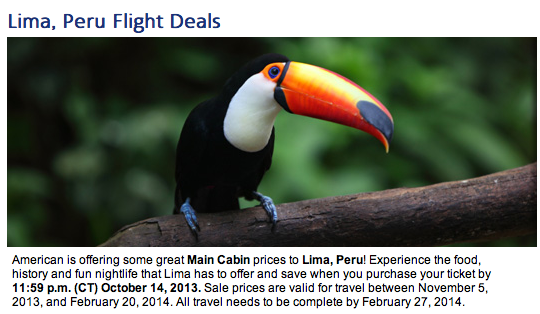 The fare rule highlights: “These fares are valid for departures January 5, 2013 through March 20, 2013. Tickets must be purchased before December 6, 2012 11:59PM EDT.” We noted that Flying Blue members (the frequent flyer program of Air France and KLM) get miles credit, but at a reduced rate — 3400-ish for the trip. (Booked through their partner Delta, I would get 11,041 status qualifying miles.) The fare cannot be cancelled. There is a $250 change fee. How to make the flight even better: As you go through booking on the KLM website, you have the option to select your seats. 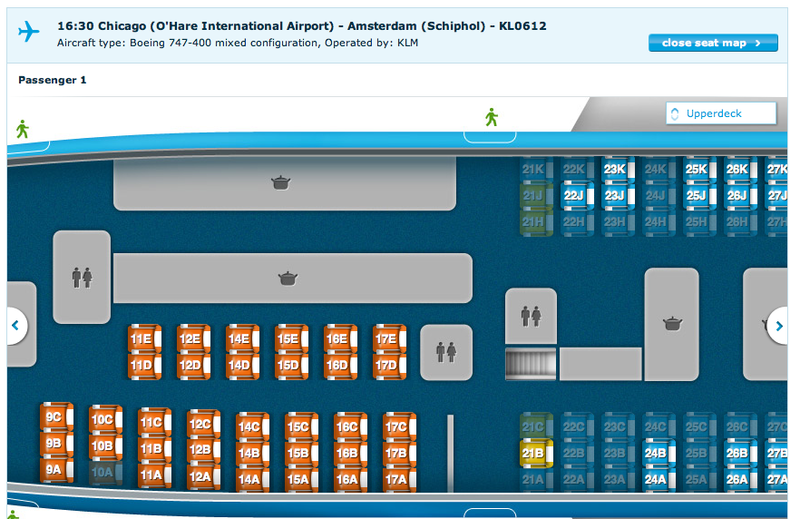 The long leg (Chicago to Amsterdam) is on a 747-400 “Combi” that includes KLM’s “economy comfort” seating option. I was amazed to see that these highly discounted seats can be upgraded for $123 on each of the long legs (ORD to AMS and the return). Adding $123 and $123 to the $531.28 fare brings the ticket price to $777.28 — still quite a bargain — with 4 extra inches of legroom comfort and double the recline included! Economy Comfort seats in Orange. Economy seats in Blue. 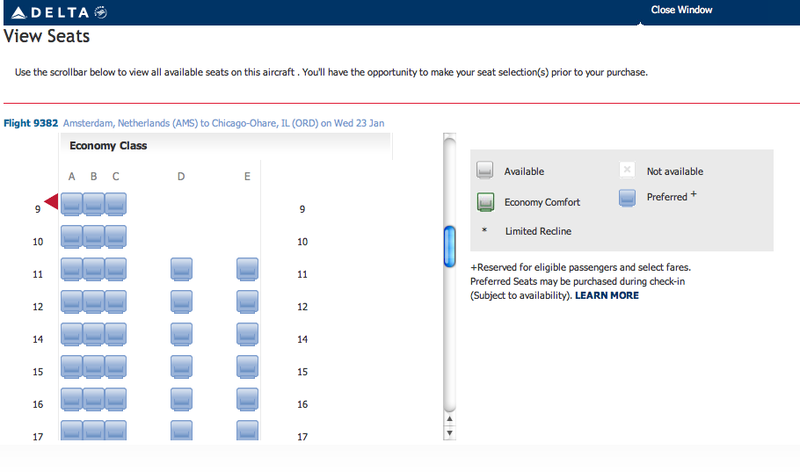 By upgrading to “economy comfort” you can select the only two-across seating (11 through 17 D & E) in economy class. I’ve never flown this 747 configuration, so I checked SeatGuru.com. Some people mentioned that the D/E row seats can be cold. I prefer cold to hot, but be sure to get a blanket. The shorter Amsterdam to Istanbul flight can also be upgraded — for $37 each way. After looking at the seat map, I probably wouldn’t bother. 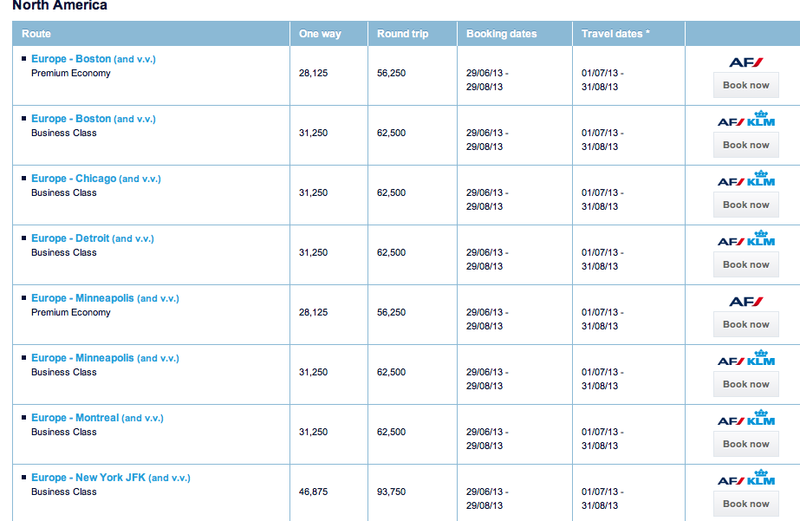 What I discovered on the KLM website: I love to use it! The site shows a very user-friendly fare chart by date for those of us who can shift schedules a day or two to save money. The seat map was the real highlight for me. When the seat selection window opened, it was love at first sight. It looked like the seating might actually look on the plane. And when I selected my seat, a little person appeared. It was magic — much more personal than airline sites that think I’m just an “x” in a box, like some tic-tac-toe thing. Summary: If you’ve wanted to go to Turkey, maybe adding a quick flight to Athens, Greece, during your stay; it won’t get any better. And you can schedule a long (15 hour) layover in Amsterdam, if you’d like to spend the day there before continuing on to Istanbul.